Today, as part of my ongoing acknowledgement celebration of the 50th anniversary of Daredevil this month, I’m conducting a bit of a blogging experiment between Chasing Amazing and Longbox Graveyard. This post, along with one I guest blogged for LBG, look at one of Marvel’s greatest rogues, Wilson Fisk, aka, Kingpin, two different ways. My LBG piece looks at Fisk through the lens of his relationship with Daredevil, while Chasing Amazing will talk about Kingpin’s rise to general prominence and relevance as a Spider-Man adversary during the Silver Age of comics. 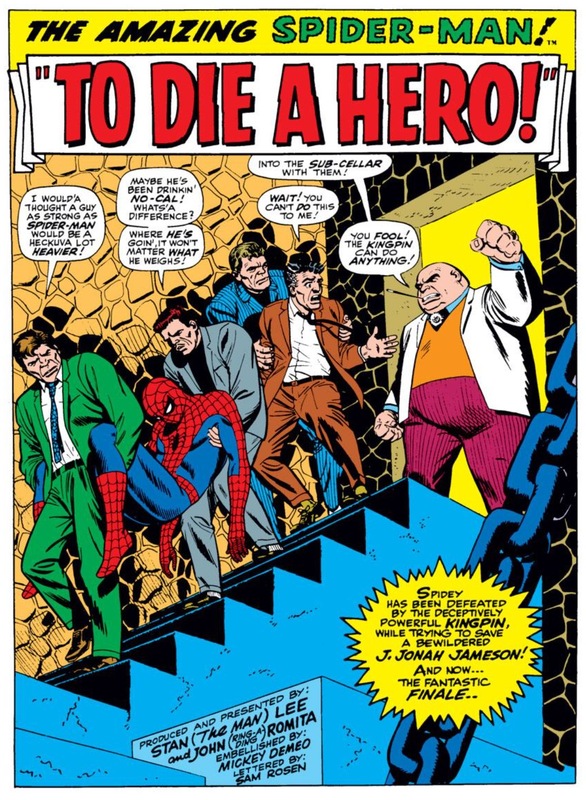 Kingpin made his first appearance in Amazing Spider-Man #50 and is arguably one of the best characters – hero, villain or otherwise – to be created during the Stan Lee/John Romita Sr.-era on the book. That’s not necessarily saying much. Nothing against Romita, who is as great of an artist as it gets, but his track record for character creation was hit or miss during his time on ASM, especially when you consider the plethora of iconic villains that were pumped out during Lee and Steve Ditko’s time on the title (Doctor Octopus, Green Goblin, Kraven, Vulture, Sandman, Electro, etc.). But of all the adversaries Romita created, Kingpin has managed to stand the test of time better than the rest – and not just because he was used so magnificently in the world of Daredevil (as I outlined in my LBG post). For a solid 2-3 year period, Kingpin was the premier bad guy in the Spider-verse, tangling with Spidey multiple times and proving to be a very difficult nemesis for the Web Slinger to subdue. 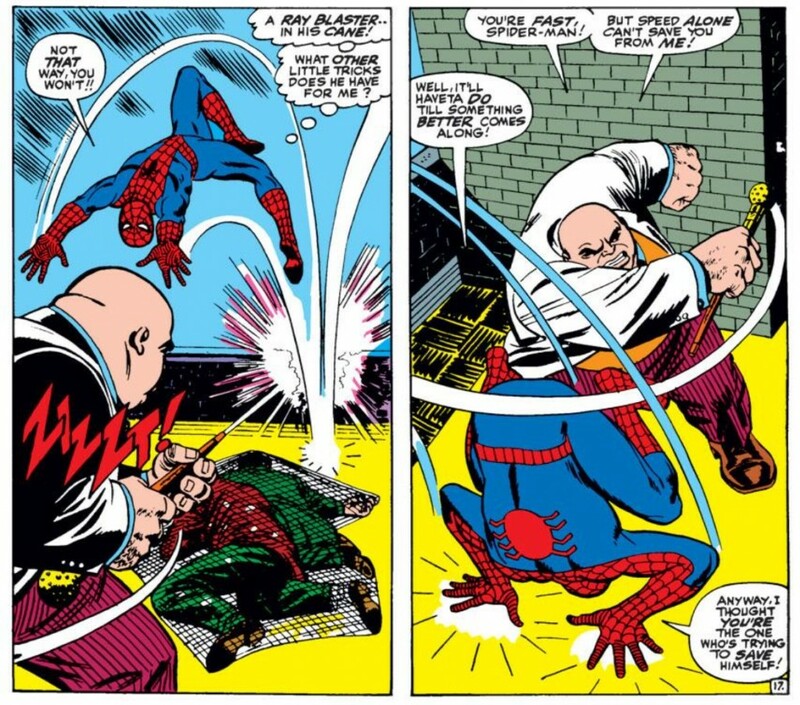 Giving Spider-Man a legitimate criminal “Kingpin” to combat was a logical progression for a superhero who had long been defined as a “street level” character, despite the fact that the bulk of the villains he fought were more fantastical with outrageous powers. The Enforcers had potential as a criminal stable but they quickly lost their allure when their leader, Frederick Foswell, aka, the Big Man, changed his stripes and became a Daily Bugle reporter. The Crime-Master was killed off as quickly as he arrived in his main arc in the Ditko/Lee-era. And the Green Goblin was taking shape as an underworld boss until Lee/Romita unveiled him as an industrialist with psychological issues in ASM #39-40. Large and rotund, with a commanding presence, Kingpin is every bit the “boss” the way all of these other street level villains were not.Despite not having any true “superpowers” to speak of, he was shockingly great in combat, moving with the speed and grace of a ninja, while packing the physical wallop of someone with his girth. Kingpin makes a major impression on the Spider-Man universe in his inaugural arc, as he not only makes life difficult for our titular hero, but for many of ASM’s supporting cast members. 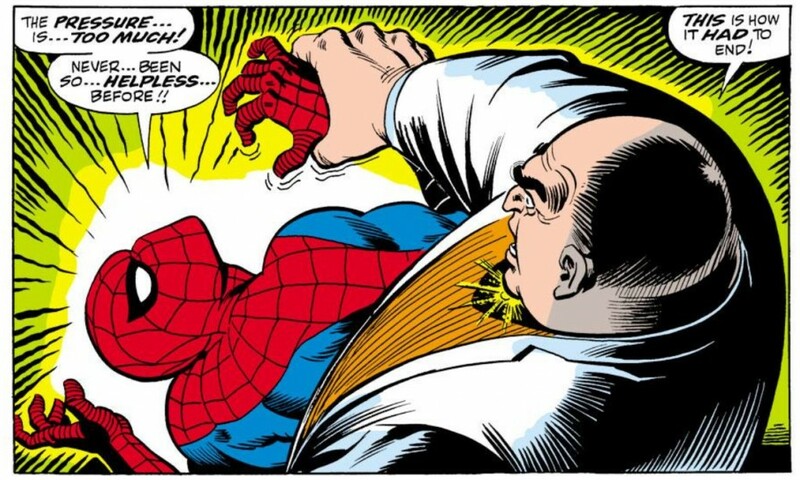 In a move befitting of a criminal bossman, Kingpin threatens Bugle publisher/editor-in-chief J. Jonah Jameson to give up his crusade to expose the rise of organized crime of New York City and when the blustery Jonah refuses to yield, he kidnaps and attempts to murder him (tied to Spider-Man no less!). Kingpin would later torture another Bugle employee in ace reporter Ben Urich in Daredevil, but watching him intimidate Jonah is equally gratifying in these Spider-Man stories. Still, Silver Age/Spider-Man-era Kingpin has some very silly characteristics befitting more of a Bond-villain rather than the cerebral monster he was in Daredevil. There’s the oh-so-60’s weapon that Kingpin uses in ASM, a cane with a laser blaster. And then there’s the second major storyline involving Kingpin where Fisk brainwashes Captain Stacy, the father of Peter’s love, Gwen. Not that there’s anything necessarily wrong with mind control storylines in comics (we just wrapped up one that lasted 16 months in Superior Spider-Man ), but in the case of Silver Age Spider-Man, these ideas are accompanied with a layer of gloss and glibness that gets washed away once the era of comics transitions from Silver to Bronze. 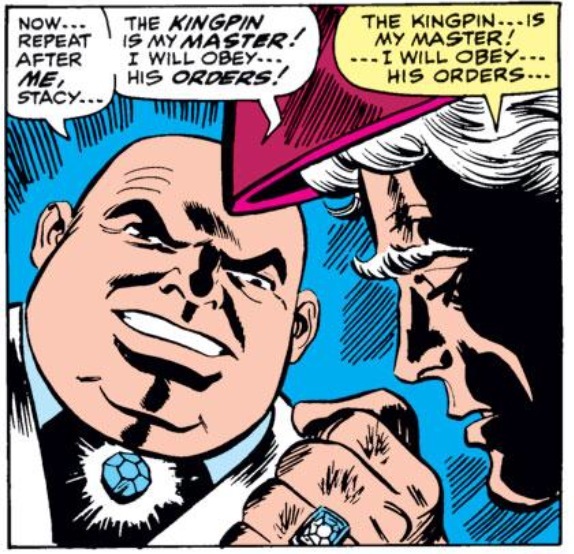 Plus, similar to a lot of other ASM storylines during the Lee/Romita run, Kingpin’s mind control act was a device more geared towards advancing some romantic drama between Peter and Gwen. In melodramatic fashion, Gwen walks in on Peter as he’s physically struggling with a mind-controlled Captain Stacy, leading to a massive misunderstanding between the two teen lovers. In effect, Kinpin’s evil actions end up taking a back seat to the larger conflict involving the tenuous nature of Peter and Gwen’s romance. 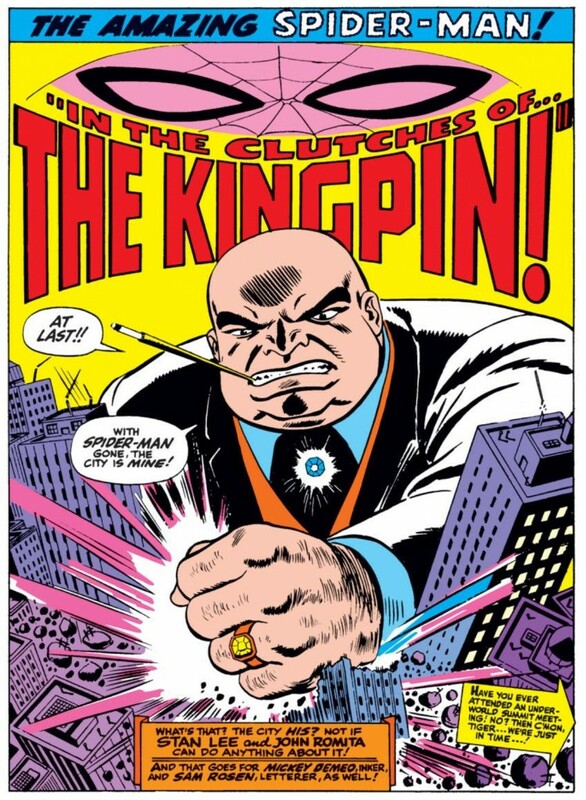 Lee and Romita would frequently return to Kingpin throughout their run on the title. 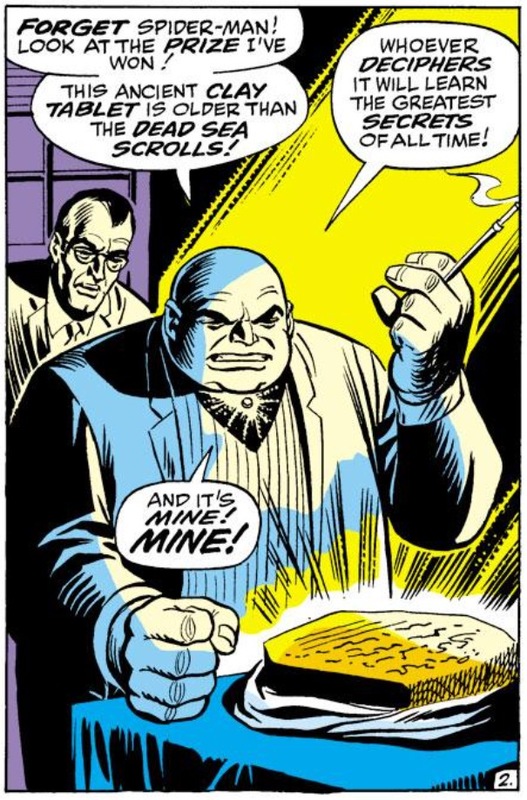 Most famously, Kingpin shows up to kick off one of the first long-long-term storylines in Silver Age ASM history in the “Petrified Tablet” saga. This storyline focuses on a tablet that has special, mystical powers is that has been obtained by Empire State University, leading to Kingpin wanting to steal the relic to enhance his own power and wealth. The Kingpin storyline spanned four issues of the overall arc (ASM #68-71) before giving way to other villains entering the fray like Shocker, Quicksilver, Man Mountain Marko and Silvermane. All told, Marvel spent more than half of year dedicated to this one arc – a level of serial continuity that was just unheard of in the 1960s. And Kingpin was the guy Stan and JRSR used to put this thing into motion – the straw that stirred the drink, as Reggie Jackson would say. Kingpin’s role in ASM during this time period begs a larger question – can a villain graduate to elite “arch nemesis” status though repeated use and exposure? The character would get involved in far more iconic stories in which he was portrayed in a more complex, compelling nature than what readers ultimately got in Silver Age ASM, and yet he still made his mark in Spider-Man comics just because he appeared in nearly every major storyline. No other Spider-Man villain was getting this kind of preferential treatment from the creators during this time period – not Doc Ock, not Electro, not Lizard, and not Green Goblin. 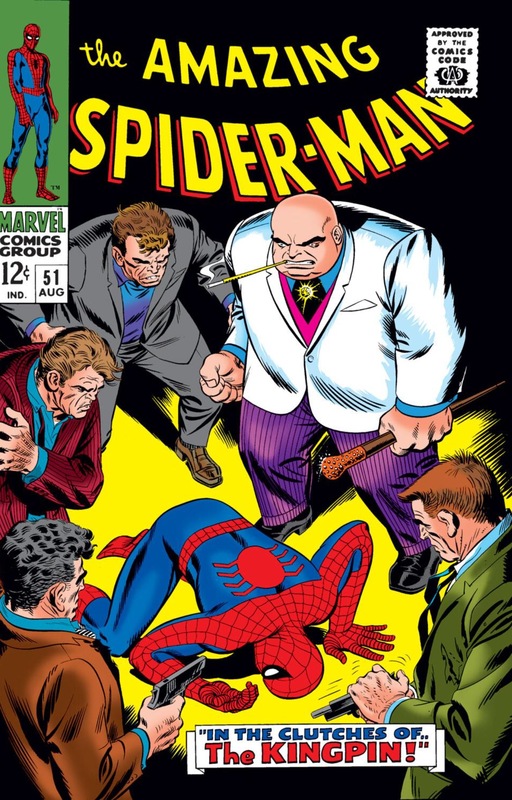 Between 1968 and 1969, there were almost more Spider-Man comics that featured Kingpin than didn’t. So where does that ultimately leave Kingpin in the annals of Spider-Man’s greatest villains? It’s rare for a villain that had such a significant presence in one title to become the greatest rogue of all-time for another villain as what happened with Kingpin vis a vis Daredevil (and we haven’t even mentioned Fisk’s role with Punisher). Unquestionably, Fisk is a top 10 Spider-Man villain. Top five though? That’s where it gets tricky to determine. 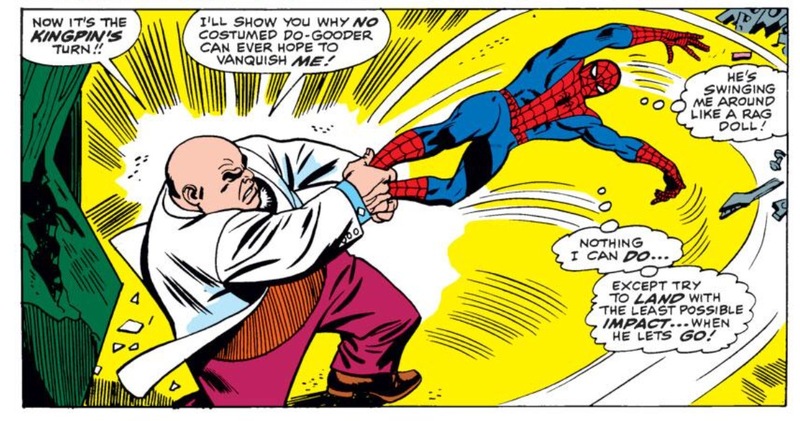 Of course, there’s more to Kingpin’s Spider-Man career than just these three Silver Age stories. But I’m not sure if that helps or hurts his claims as a top Spidey rogue. In one Bronze Age storyline, he actually leaves the criminal underworld (only to take it back up again when he enters the Daredevil universe). Kingpin is the major antagonist in the late 2000s “Back in Black” storyline in which Aunt May is shot by an assassin working for Fisk as a result of Peter revealing his identity for “Civil War,” but that entire storyline reads so incredibly out of sync with the standard character dynamic for Spider-Man, it’s hard to think of “Back in Black’ in overwhelmingly positive fashion. Fisk also makes a return in the Amazing Spider-Man: Family Business graphic novel, which was one of the better Kingpin/Spider-Man storylines over the past decade. The problem with Fisk and Spider-Man is if you click over to my Daredevil post (I’ll give you that link again in case you forgot! ), you’ll witness not only some of the best Kingpin stories ever, but some of the greatest Marvel Comics storylines ever. Kingpin was a sensible villain choice for Spidey, and he was used often enough to allow him to come across as a beat of a short-term arch nemesis, but he certainly can’t stake the claim as being the “boss” of the Spider-verse. In “Comic Creators on Spider-Man”, Romita specifically cited James Bond-villains as his inspiration for the Kingpin, including his own sultry vamp in Venessa. While Godfather-Kingpin is a better fit for Daredevil, I do prefer Bond-Kingpin for Spidey. It’s just the right blend of street-level and fantasy. I think Fisk’s overall problem is that, despite all his Grade-A villainy, he’s never personally impacted Peter outside of his superhero persona. Meanwhile, dude has admirably straight-up wrecked Matt’s life, leading to great stories. Peter beating the ever-lovin’ crap out of the Kingpin during “Back in Black” is one of my favorite Spider-Man moments of the last decade. It makes me frame all of their past battles in a different light since we now know just how much Peter was holding back.